Kindergarten and first grade talent development will be exploring imagery, specifically the imagery of Autumn. The kids and I will spend some of our time outside exploring the grounds of Brookdale with graphic organizers to record what we hear, see, feel, and smell. The organizers will be used to create a fall poem after we read some examples. Second grade PA will be finishing up our work with "Lemonade" poems where one large word is broken into all of the other possible words that can be created using the letters of the original word. The list of words created are then used to write a poem about the original large word. 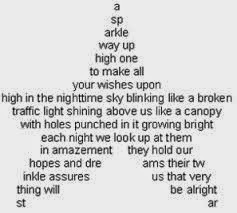 These poems will be written as concrete poems, or a poem that looks like the topic of the poem...see the image below. At home this week, discuss the difference between things that are concrete and abstract. Concrete things you can see or touch like the grass, and abstract things you cannot like love or friendship. Third grade PA will continue working on their Shine projects and develop the presentations which will be given in class next week on Tuesday. We will also be discussing "making a difference" using the Chris Van Allsburg book Ben's Dream next week when the presentations are complete. The kids have been working together, brilliantly, in teams for this project, and I have been blown away by what I've observed. Third graders are having complex conversations about learning, what should be learned, how to share and explain their ideas to peers, and what the kids of Shine need to know to survive. Fourth grade PA will finish The Secret Garden this week. The kids and I have had a great time reading and talking about this classic novel. The students will be writing a summative essay on the book in class this week and next week. Everyone will have some homework to finish this 2-4 page piece by Thursday the 23rd.